The Vietnam War (Vietnamese: Chiến tranh Việt Nam), also known as the Second Indochina War, and also known in Vietnam as Resistance War Against America (Vietnamese: Kháng chiến chống Mỹ) or simply the American War, was a Cold War-era proxy war that occurred in Vietnam, Laos, and Cambodia from 1 November 1955[A 1] to the fall of Saigon on 30 April 1975. This war followed the First Indochina War (1946–54) and was fought between North Vietnam—supported by the Soviet Union, China and other communist allies—and the government of South Vietnam—supported by the United States, Philippines and other anti-communist allies. The Viet Cong (also known as the National Liberation Front, or NLF), a South Vietnamese communist common front aided by the North, fought a guerrilla war against anti-communist forces in the region. The People’s Army of Vietnam (also known as the North Vietnamese Army) engaged in a more conventional war, at times committing large units to battle. As the war continued, the part of the Viet Cong in the fighting decreased as the role of the NVA grew. U.S. and South Vietnamese forces relied on air superiority and overwhelming firepower to conduct search and destroy operations, involving ground forces, artillery, and airstrikes. In the course of the war, the U.S. conducted a large-scale strategic bombing campaign against North Vietnam, and over time the North Vietnamese airspace became the most heavily defended in the world. The U.S. government viewed its involvement in the war as a way to prevent a Communist takeover of South Vietnam. This was part of a wider containment policy, with the stated aim of stopping the spread of communism. The North Vietnamese government and the Viet Cong were fighting to reunify Vietnam under communist rule. They viewed the conflict as a colonial war, fought initially against forces from France and then America, and later against South Vietnam. Beginning in 1950, American military advisors arrived in what was then French Indochina. [A 3] U.S. involvement escalated in the early 1960s, with troop levels tripling in 1961 and again in 1962. U.S. involvement escalated further following the 1964 Gulf of Tonkin incident, in which a U.S. destroyer clashed with North Vietnamese fast attack craft, which was followed by the Gulf of Tonkin Resolution, which gave the U.S. president authorization to increase U.S. military presence. Regular U.S. combat units were deployed beginning in 1965. Operations crossed international borders: bordering areas of Laos and Cambodia were heavily bombed by U.S. forces as American involvement in the war peaked in 1968, the same year that the communist side launched the Tet Offensive. The Tet Offensive failed in its goal of overthrowing the South Vietnamese government but became the turning point in the war, as it persuaded a large segment of the United States population that its government’s claims of progress toward winning the war were illusory despite many years of massive U.S. military aid to South Vietnam. Gradual withdrawal of U.S. ground forces began as part of “Vietnamization“, which aimed to end American involvement in the war while transferring the task of fighting the Communists to the South Vietnamese themselves. Despite the Paris Peace Accord, which was signed by all parties in January 1973, the fighting continued. In the U.S. and the Western world, a large anti-Vietnam War movement developed as part of a larger counterculture. The war changed the dynamics between the Eastern and Western Blocs, and altered North-South relations. —————————————————————-See also: Role of the United States in the Vietnam War § John F. Kennedy (1961–1963), 1960 South Vietnamese coup attempt, 1962 South Vietnamese Independence Palace bombing, Huế Phật Đản shootings and Xá Lợi Pagoda raidsMain articles: Cable 243, Arrest and assassination of Ngô Đình Diệm, Buddhist crisis, Krulak Mendenhall mission, McNamara Taylor mission, 1963 South Vietnamese coup and Reaction to the 1963 South Vietnamese coupThe inept performance of the South Vietnamese army was exemplified by failed actions such as the Battle of Ap Bac on 2 January 1963, in which a small band of Viet Cong won a battle against a much larger and better-equipped South Vietnamese force, many of whose officers seemed reluctant even to engage in combat. As historian James Gibson summed up the situation:Strategic hamlets had failed…. The South Vietnamese regime was incapable of winning the peasantry because of its class base among landlords. Indeed, there was no longer a ‘regime’ in the sense of a relatively stable political alliance and functioning bureaucracy. Instead, civil government and military operations had virtually ceased. The National Liberation Front had made great progress and was close to declaring provisional revolutionary governments in large areas. A US tank convoy during the Vietnam War.The ARVN were led in that battle by Diệm’s most trusted general, Huỳnh Văn Cao, commander of the IV Corps. Cao was a Catholic who had been promoted due to religion and fidelity rather than skill, and his main job was to preserve his forces to stave off coups; he had earlier vomited during a communist attack. Some policymakers in Washington began to conclude that Diệm was incapable of defeating the communists and might even make a deal with Ho Chi Minh. He seemed concerned only with fending off coups, and had become more paranoid after attempts in 1960 and 1962, which he partly attributed to U.S. encouragement. As Robert F. Kennedy noted, “Diệm wouldn’t make even the slightest concessions. He was difficult to reason with…”Discontent with Diệm’s policies exploded following the Huế Phật Đản shootings of nine majority Buddhists who were protesting against the ban on the Buddhist flag on Vesak, the Buddha’s birthday. This resulted in mass protests against discriminatory policies that gave privileges to the Catholic Church and its adherents. Diệm’s elder brother Ngô Đình Thục was the Archbishop of Huế and aggressively blurred the separation between church and state. Thuc’s anniversary celebrations shortly before Vesak had been bankrolled by the government, and Vatican flags were displayed prominently. There had also been reports of Buddhist pagodas being demolished by Catholic paramilitaries throughout Diệm’s rule. Diệm refused to make concessions to the Buddhist majority or take responsibility for the deaths. On 21 August 1963, the ARVN Special Forces of Colonel Lê Quang Tung, loyal to Diệm’s younger brother Ngô Đình Nhu, raided pagodas across Vietnam, causing widespread damage and destruction and leaving a death toll estimated to range into the hundreds. 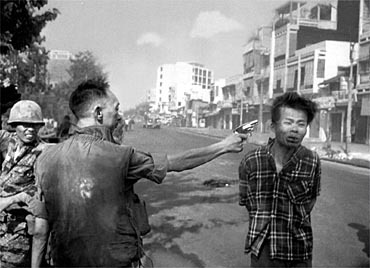 Kennedy and McNamara Ngô Đình Diệm after being shot and killed in the 1963 coup.U.S. officials began discussing the possibility of a regime change during the middle of 1963. The United States Department of State was generally in favor of encouraging a coup, while the Defense Department favored Diệm. Chief among the proposed changes was the removal of Diệm’s younger brother Nhu, who controlled the secret police and special forces and was seen as the man behind the Buddhist repression and more generally the architect of the Ngô family’s rule. This proposal was conveyed to the U.S. embassy in Saigon in Cable 243.The Central Intelligence Agency (CIA) was in contact with generals planning to remove Diệm. They were told that the United States would not oppose such a move nor punish the generals by cutting off aid. President Diệm was overthrown and executed, along with his brother, on 2 November 1963. When he was informed, Maxwell Taylor remembered that Kennedy “rushed from the room with a look of shock and dismay on his face.” He had not anticipated Diệm’s murder. The U.S. ambassador to South Vietnam, Henry Cabot Lodge, invited the coup leaders to the embassy and congratulated them. Ambassador Lodge informed Kennedy that “the prospects now are for a shorter war”. Kennedy wrote Lodge a letter congratulating him for “a fine job.”Following the coup, chaos ensued. Hanoi took advantage of the situation and increased its support for the guerrillas. South Vietnam entered a period of extreme political instability, as one military government toppled another in quick succession. Increasingly, each new regime was viewed by the communists as a puppet of the Americans; whatever the failings of Diệm, his credentials as a nationalist (as Robert McNamara later reflected) had been impeccable.U.S military advisors were embedded at every level of the South Vietnamese armed forces. They were however criticized for ignoring the political nature of the insurgency. The Kennedy administration sought to refocus U.S. efforts on pacification and “winning over the hearts and minds” of the population. The military leadership in Washington, however, was hostile to any role for U.S. advisors other than conventional troop training. General Paul Harkins, the commander of U.S. forces in South Vietnam, confidently predicted victory by Christmas 1963. The CIA was less optimistic, however, warning that “the Viet Cong by and large retain de facto control of much of the countryside and have steadily increased the overall intensity of the effort”.Paramilitary officers from the CIA’s Special Activities Division trained and led Hmong tribesmen in Laos and into Vietnam. The indigenous forces numbered in the tens of thousands and they conducted direct action missions, led by paramilitary officers, against the Communist Pathet Lao forces and their North Vietnamese supporters. The CIA also ran the Phoenix Program and participated in Military Assistance Command, Vietnam – Studies and Observations Group (MAC-V SOG), which was originally named the Special Operations Group, but was changed for cover purposes.Johnson’s escalation, 1963–69Main article: Joint warfare in South Vietnam, 1963–69Further information: Role of United States in the Vietnam War: AmericanizationSee also: Opposition to the U.S. involvement in the Vietnam War, Gulf of Tonkin incident, 1964 South Vietnamese coup, September 1964 South Vietnamese coup attempt, December 1964 South Vietnamese coup and 1965 South Vietnamese coup A U.S. B-66 Destroyer and four F-105 Thunderchiefs dropping bombs on North Vietnam during Operation Rolling ThunderAt the time Lyndon B. Johnson took over the presidency after the death of Kennedy, he had not been heavily involved with policy toward Vietnam, Presidential aide Jack Valenti recalls, “Vietnam at the time was no bigger than a man’s fist on the horizon. We hardly discussed it because it was not worth discussing.”Upon becoming president, however, Johnson immediately had to focus on Vietnam: on 24 November 1963, he said, “the battle against communism […] must be joined […] with strength and determination.” The pledge came at a time when the situation in South Vietnam was deteriorating, especially in places like the Mekong Delta, because of the recent coup against Diệm.The military revolutionary council, meeting in lieu of a strong South Vietnamese leader, was made up of 12 members headed by General Dương Văn Minh—whom Stanley Karnow, a journalist on the ground, later recalled as “a model of lethargy.” Lodge, frustrated by the end of the year, cabled home about Minh: “Will he be strong enough to get on top of things?” His regime was overthrown in January 1964 by General Nguyễn Khánh. However, there was persistent instability in the military as several coups—not all successful—occurred in a short space of time. An alleged Viet Cong activist, captured during an attack on an American outpost near the Cambodian border, is interrogated.On 2 August 1964, the USS Maddox, on an intelligence mission along North Vietnam’s coast, allegedly fired upon and damaged several torpedo boats that had been stalking it in the Gulf of Tonkin. A second attack was reported two days later on the USS Turner Joy and Maddox in the same area. The circumstances of the attack were murky. Lyndon Johnson commented to Undersecretary of State George Ball that “those sailors out there may have been shooting at flying fish.”The second attack led to retaliatory air strikes, prompted Congress to approve the Gulf of Tonkin Resolution on 7 August 1964, signed by Johnson, and gave the president power to conduct military operations in Southeast Asia without declaring war. Although Congressmen at the time denied that this was a full-scale war declaration, the Tonkin Resolution allowed the president unilateral power to launch a full-scale war if the president deemed it necessary. In the same month, Johnson pledged that he was not “… committing American boys to fighting a war that I think ought to be fought by the boys of Asia to help protect their own land.”An undated NSA publication declassified in 2005, however, revealed that there was no attack on 4 August. It had already been called into question long before this. “Gulf of Tonkin incident”, writes Louise Gerdes, “is an oft-cited example of the way in which Johnson misled the American people to gain support for his foreign policy in Vietnam.” George C. Herring argues, however, that McNamara and the Pentagon “did not knowingly lie about the alleged attacks, but they were obviously in a mood to retaliate and they seem to have selected from the evidence available to them those parts that confirmed what they wanted to believe.””From a strength of approximately 5,000 at the start of 1959 the Viet Cong’s ranks grew to about 100,000 at the end of 1964…Between 1961 and 1964 the Army’s strength rose from about 850,000 to nearly a million men.” The numbers for U.S. troops deployed to Vietnam during the same period were quite different; 2,000 in 1961, rising rapidly to 16,500 in 1964. By early 1965, 7,559 South Vietnamese hamlets had been destroyed by the Viet Cong. A marine from 1st Battalion, 3rd Marines, moves an alleged Viet Cong activist to the rear during a search and clear operation held by the battalion 15 miles (24 km) west of Da Nang Air Base.The National Security Council recommended a three-stage escalation of the bombing of North Vietnam. On 2 March 1965, following an attack on a U.S. Marine barracks at Pleiku,Operation Flaming Dart (initiated when Soviet Premier Alexei Kosygin was on a state visit to North Vietnam), Operation Rolling Thunder and Operation Arc Light commenced. The bombing campaign, which ultimately lasted three years, was intended to force North Vietnam to cease its support for the Viet Cong by threatening to destroy North Vietnam’s air defenses and industrial infrastructure. As well, it was aimed at bolstering the morale of the South Vietnamese. Between March 1965 and November 1968, “Rolling Thunder” deluged the north with a million tons of missiles, rockets and bombs.Bombing was not restricted to North Vietnam. Other aerial campaigns, such as Operation Commando Hunt, targeted different parts of the Viet Cong and NVA infrastructure. These included the Ho Chi Minh trail supply route, which ran through Laos and Cambodia. The objective of stopping North Vietnam and the Viet Cong was never reached. As one officer noted, “This is a political war and it calls for discriminate killing. The best weapon… would be a knife… The worst is an airplane.” The Chief of Staff of the United States Air ForceCurtis LeMay, however, had long advocated saturation bombing in Vietnam and wrote of the communists that “we’re going to bomb them back into the Stone Age”.Escalation and ground warPlay media Universal Newsreel film about an attack on U.S. air bases and the U.S. response. 1965 Peasants suspected of being Viet Cong under detention of U.S. army, 1966 Start of Tet Offensive as seen looking north from LZ Betty’s water tower, just south of Quang Tri City Heavily bandaged woman with a tag attached to her arm which reads ‘VNC Female’ meaning Vietnamese civilianAfter several attacks upon them, it was decided that U.S. Air Force bases needed more protection as the South Vietnamese military seemed incapable of providing security. 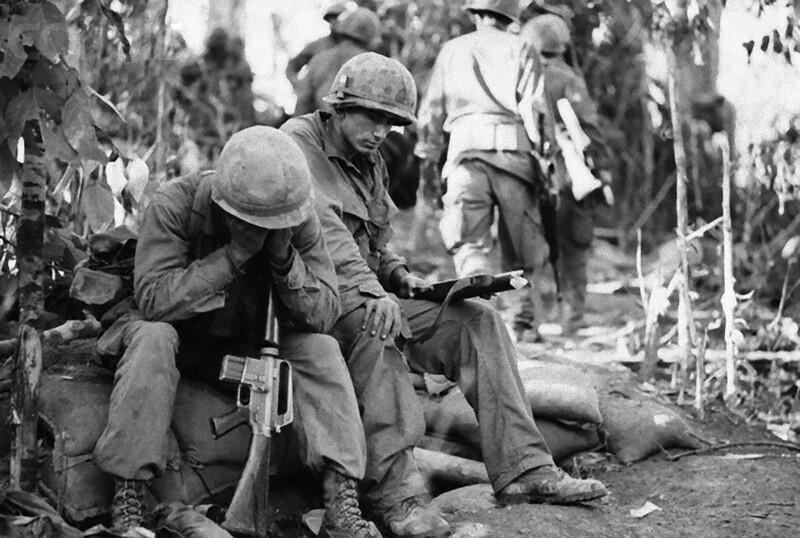 On 8 March 1965, 3,500 U.S. Marines were dispatched to South Vietnam. This marked the beginning of the American ground war. U.S. public opinion overwhelmingly supported the deployment.In a statement similar to that made to the French almost two decades earlier, Ho Chi Minh warned that if the Americans “want to make war for twenty years then we shall make war for twenty years. If they want to make peace, we shall make peace and invite them to afternoon tea.” As former First Deputy Foreign Minister Tran Quang Co has noted, the primary goal of the war was to reunify Vietnam and secure its independence. Some have argued that the policy of North Vietnam was not to topple other non-communist governments in South East Asia. However, the Pentagon Papers warned of “a dangerous period of Vietnamese expansionism….Laos and Cambodia would have been easy pickings for such a Vietnam….Thailand, Malaya, Singapore, and even Indonesia, could have been next.”The Marines’ initial assignment was defensive. The first deployment of 3,500 in March 1965 was increased to nearly 200,000 by December. The U.S. military had long been schooled in offensive warfare. Regardless of political policies, U.S. commanders were institutionally and psychologically unsuited to a defensive mission. In December 1964, ARVN forces had suffered heavy losses at the Battle of Bình Giã, in a battle that both sides viewed as a watershed. Previously, communist forces had utilized hit-and-run guerrilla tactics. However, at Binh Gia, they had defeated a strong ARVN force in a conventional battle. Tellingly, South Vietnamese forces were again defeated in June 1965 at the Battle of Đồng Xoài. U.S. soldiers searching a village for Viet CongDesertion rates were increasing, and morale plummeted. General William Westmoreland informed Admiral U. S. Grant Sharp Jr., commander of U.S. Pacific forces, that the situation was critical. He said, “I am convinced that U.S. troops with their energy, mobility, and firepower can successfully take the fight to the NLF [National Front for the Liberation of South Vietnam a.k.a. the Viet Cong].” With this recommendation, Westmoreland was advocating an aggressive departure from America’s defensive posture and the sidelining of the South Vietnamese. By ignoring ARVN units, the U.S. commitment became open-ended. Westmoreland outlined a three-point plan to win the war:Phase 1. Commitment of U.S. (and other free world) forces necessary to halt the losing trend by the end of 1965.Phase 2. U.S. and allied forces mount major offensive actions to seize the initiative to destroy guerrilla and organized enemy forces. This phase would end when the enemy had been worn down, thrown on the defensive, and driven back from major populated areas.Phase 3. If the enemy persisted, a period of twelve to eighteen months following Phase 2 would be required for the final destruction of enemy forces remaining in remote base areas.The plan was approved by Johnson and marked a profound departure from the previous administration’s insistence that the government of South Vietnam was responsible for defeating the guerrillas. Westmoreland predicted victory by the end of 1967. Johnson did not, however, communicate this change in strategy to the media. Instead he emphasized continuity. The change in U.S. policy depended on matching the North Vietnamese and the Viet Cong in a contest of attrition and morale. The opponents were locked in a cycle of escalation. The idea that the government of South Vietnam could manage its own affairs was shelved. Soviet Premier Alexei Kosygin with U.S. President Lyndon B. Johnson at the Glassboro Summit Conference where the two representatives discussed the possibilities of a peace settlement.The one-year tour of duty of American soldiers deprived units of experienced leadership. As one observer noted “we were not in Vietnam for 10 years, but for one year 10 times.” As a result, training programs were shortened.South Vietnam was inundated with manufactured goods. As Stanley Karnow writes, “the main PX [Post Exchange], located in the Saigon suburb of Cholon, was only slightly smaller than the New York Bloomingdale’s…” The American buildup transformed the economy and had a profound effect on South Vietnamese society. A huge surge in corruption was witnessed. The Ho Chi Minh Trail running through Laos, 1967Washington encouraged its SEATO allies to contribute troops. Australia, New Zealand, South Korea, Thailand, and the Philippines all agreed to send troops. Major allies, however, notably NATO nations Canada and the United Kingdom, declined Washington’s troop requests. The U.S. and its allies mounted complex operations, such as operations Masher, Attleboro, Cedar Falls, and Junction City. However, the communist insurgents remained elusive and demonstrated great tactical flexibility.Meanwhile, the political situation in South Vietnam began to stabilize with the coming to power of prime minister Air Marshal Nguyen Cao Ky and figurehead Chief of State, General Nguyễn Văn Thiệu, in mid-1965 at the head of a military junta. This ended a series of coups that had happened more than once a year. In 1967, Thieu became president with Ky as his deputy, after rigged elections. Although they were nominally a civilian government, Ky was supposed to maintain real power through a behind-the-scenes military body. However, Thieu outmaneuvered and sidelined Ky by filling the ranks with generals from his faction. Thieu was also accused of murdering Ky loyalists through contrived military accidents. Thieu, mistrustful and indecisive, remained president until 1975, having won a one-candidate election in 1971.The Johnson administration employed a “policy of minimum candor” in its dealings with the media. Military information officers sought to manage media coverage by emphasizing stories that portrayed progress in the war. Over time, this policy damaged the public trust in official pronouncements. As the media’s coverage of the war and that of the Pentagon diverged, a so-called credibility gap developed.